If my team can't win the World Series this season, and I'll keep quiet on who that is (have to stay impartial), then I hope the Cleveland Indians do it. That city really could use some good news with the sorry Browns and overrated Cavaliers. No Cleveland team has won a major sports title since 1964 when the Browns took the NFL championship. Could the Tribe end that drought in 2016? From a pitching perspective, absolutely. I'm just not sure there's enough hitting or enough payroll flexibility to go get any. It's very important for this team to get off to a good start. In each of Manager Terry Francona's three seasons, the Indians have stumbled out of the gates. In 2013, they were 11-13 through April. The following year they were 11-17 through April. Last season, they were 7-14. But the Indians usually close strong, and last year was no different as the Tribe had the fourth-most wins in the AL in the second half. But that hole was just too deep. Cleveland finished 81-80 (one postponed game not made up), good for third in the AL Central and the team's third straight winning record. The division seems very winnable this season, but the Tribe again were very quiet in free agency. They also didn't lose anyone of note, I suppose. Cleveland opens the season on April 4 against Boston. First let's start with the team's best all-around player in left fielder and All-Star Michael Brantley. He was injured late last season on a diving catch attempt in Minnesota and had November surgery to repair a torn labrum in his right shoulder. The team was hoping he could avoid surgery altogether, so that was the reason for the delay. Originally, Brantley wasn't perhaps expected until June. Now? He just started playing in spring training games and could be ready for Opening Day. That's huge. Brantley hit .310 with 15 homers, 84 RBIs and 15 steals last year. The Indians also have another potential outfield worry, as in February center fielder Abraham Almonte was suspended 80 games for testing positive for a PED. As with about every player, Almonte swore he didn't know how it got into his system. Yeah right. After he was acquired by the Indians at the 2015 trade deadline for reliever Marc Rzepczynski, Almonte played in 51 games for Cleveland, hitting .264 with five home runs and 20 RBIs. The Indians did add free-agent outfielder Rajai Davis. He was a platoon player with the Tigers last year and had eight home runs, 30 RBIs and 15 steals. The club also added first baseman/DH Mike Napoli. He hit .224 with 18 home runs and 50 RBIs for Boston and Texas in 2015. Not too exciting. 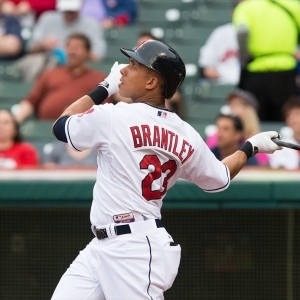 Thus it's rather tough to project a batting order for this club right now because Brantley is so key to it all. He usually bats third. Second baseman Jason Kipnis (.300, 9 HRs, 52 RBIs) should lead off, and he's one of the best offensive players at his position in the game. Then likely shortstop Francisco Lindor, the team's former No. 1 prospect who looks like a future superstar. Lindor hit better in the majors than the minors, batting .313 with 15 HRs and 51 RBIs in 99 games. I'm not sure he's that good of a hitter, but he has a bright future. Then presumably Brantley in the No. 3 hole, followed by Napoli and DH Carlos Santana (.231, 19 HRs, 85 RBIs), who has never lived up to his billing. The rest of the group likely will be right fielder Lonnie Chisenhall (.246, 7 HRs, 44 RBIs), who used to be the team's future at third base, catcher Yan Gomes (.231,12 HRs, 45 RBIs), new third baseman Juan Uribe (.253, 14 HRs, 43 RBIs) and Davis in center until Almonte comes back. Although a recent report from the Cleveland Plain Dealer says that Tyler Naguin could be the opening day starter in center. Naquin was limited to 84 games between Double- and Triple-A last season due to injury but is having a big spring. That's not a very good lineup. The Indians were 18th in runs last year, and I don't see them being any better. This team made a mistake not adding an outfielder like an Ian Desmond or Dexter Fowler or Austin Jackson while they were lingering on the free-agent market. The Indians did just add Marlon Byrd. Not sure that solves anything. The rotation could be the best in the American League. It's led by 2014 Cy Young winner Corey Kluber, who had a very good 3.49 ERA and 245 strikeouts last year but was just 9-16 with little run support. He's a Top-10 guy in the majors. He'll be followed by Carlos Carrasco (14-12, 3.63) and Danny Salazar (14-10, 3.45). You have heard a lot of rumors that the Tribe might trade one of those two guys under team-friendly contracts for a big bat. The Cubs would seem to make a great partner at some point this season in that regard. Dan Szymborski's ZiPS projects Kluber and Carrasco to be the fourth and sixth most valuable pitchers in the majors this season. Trevor Bauer (11-12, 4.55) slots in at No. 4, and the No. 5 spot is still to be determined between Josh Tomlin and Cody Anderson. Anderson came on last year to finish 7-3 with a 3.05 ERA, while Tomlin was just as effective in going 7-2 with a 3.03 ERA. Anderson is 25 and Tomlin 31, so I'm sure the Tribe would prefer it be Anderson. If you want to quibble with this rotation: it's all right-handed. In the bullpen, Cody Allen (34 saves, 2.99 ERA) was very good in his first full season as a closer in 2015. He allowed only two homers in 70 appearances. At BetOnline , Cleveland is +1800 to win the World Series, +900 for the AL pennant, +185 in the AL Central and has an "over/under" wins total of 85 wins, with the over a -130 favorite. Kluber is +350 for the Cy Young, Carrasco is +800 and Salazar +2500. Kluber has an O/U of 13.5 wins. FanGraphs projects Cleveland to finish 86-76 and first in the AL Central, five games ahead of Detroit. Baseball Prospectus has the Indians with 92 wins. That's crazy talk. Definitely go under a lot of this team's totals this season. I simply don't like that lineup enough. Go under the wins but over Kluber's total.